Are you looking for a fun way to count down the days to Christmas with your kids? 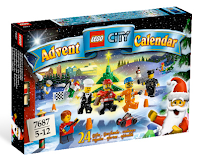 Try the Lego City Advent Calendar. This classic from Lego has been updated and is brand new for 2009. This set gives your child something new to build each day in December counting down to Christmas. Perfect for kids age 5 to 12 years old. For pricing or to read other customer reviews, click here.